At a ceremonial groundbreaking for a new chapel for suburban Portland's Lewis and Clark College, with hundreds of commissioners in attendance, students of the Presbyterian college picketed, decrying the expense of the new building and holding signs reading "The God of Chartres is Dead" and "A Chapel Not A Cathedral." From slide set B24. Depending on who you asked at the time, the new confessional position of the United Presbyterian Church in the U.S.A. -- written over the course of seven years, referred to a Special Committee of Fifteen for study and review for one year, passed by the next General Assembly and sent to the presbyteries for ratification, finally adopted and added to Presbyterians' constitution, intact, by the skin of its teeth at the General Assembly in Portland in May 1967 -- was apostasy, evidence of communist brainwashing, a threat to national security, or a milquetoast concession to political conservatives. But everyone agreed it was new. "Massed choirs from the Portland area provided musical inspiration for Commissioners and a large assemblage of visitors." It wasn't necessarily new, either. In the late 19th century, following the work of German Bible scholars' higher criticism , American Presbyterians challenged the Westminster Confession's doctrines of election, reprobation, and inerrancy of scripture, adopting the pragmatism of the age to counter Calvinist denigration of human capacity. Charles Briggs, of Union Theological Seminary, wrote that he sought "a doctrine of justification and sanctification suitable to the demands of the times." On election and predestination, Philip Schaff challenged the Presbytery of New York to create "more recognition of human responsibility" than the Confession permitted. The rapid pace of technological, economic, and social change had forced Presbyterians to square the increasingly common practice of divorce  with the moral standards of 1647. In 1888, the PCUSA General Assembly sent a question to the presbyteries: "(1) Do you desire a revision of the Confession of Faith? (2) If so, in what respects, and to what extent?" Among the chief faults of the Westminster Confession, according to Henry van Dyke, was "what was not said about God's love" -- the Confession left children who die in infancy "foreordained to everlasting death," and conceived of God's love being limited to "the elect," rather than given to all humanity. Philip Schaff, writing in the Presbyterian Review in 1889, called for progress: "Let us be honest and confess that old Calvinism is fast dying out. It has done a great work, but cannot satisfy the demands of the present age. We live in the nineteenth, not the seventeenth century. We may learn wisdom and experience from the past, but we ought not to be slaves of the past [...]"
With comments in hand, the Committee on the Revision of the Confession of Faith presented 28 amendments of Westminster to the 1892 General Assembly in Portland, Or. The Assembly adopted the revisions, and sent them to the presbyteries as 28 distinct overtures. The high-profile Briggs heresy trial all scotched passage of the amendments. Some presbyteries saw any vote on the amendments to Westminster to be divisive, and abstained; others found the amendments repellent. Ultimately, 100 presbyteries approved, 45 abstained, and 65 disapproved. Briggs was excommunicated, and fundamentalism was on the march. Within seven years, Presbyterians were back at the drawing board. In 1900, 40 presbyteries overtured the General Assembly to revise Westminster. The assembly assigned the task to a Committee of Fifteen, led by Henry van Dyke. At the 1901 Assembly, the Committee reported out A Brief Statement of Faith, which simply left out any language regarding the inerrancy of scripture and reprobation . Political consequences were almost immediate: with no confessional obstacle to their reunion, two-thirds of the Cumberland Presbyterian Church joined the PCUSA in 1905. During the fallow period of the interwar years, Westminster remained unchanged, and despite the political and material progress of the postwar period, the language of 1647 held for the people of 1957. That year, the Presbytery of Amarillo overtured the PCUSA General Assembly to update the Westminster Shorter Catechism. Upon union of the UPCNA and PCUSA in 1958, the Assembly appointed a Committee on a Brief Contemporary Statement of Faith, which opted to write a new confession outright. The Committee took seven years in its work, and presented to the 177th General Assembly in Columbus, Ohio a Book of Confessions, containing many of the major confessional documents of the Reformed tradition up through the Barmen Declaration , and adding a brief statement to be known as the Confession of 1967. The proposed Confession was delivered to a Committee of Fifteen for a year of study; the Confession was likewise offered to the denomination at large, and thousands of individual Presbyterians and their congregations, presbyteries, and synods, offered their feedback to the Committee. C67 called on Presbyterians to "fulfill the work of reconciliation," and elucidated the theme in four sections entitled "Reconciliation in society." The first was a straightforward anti-discrimination message; Presbyterians "receive and uphold one another as persons in all relationships of life: in employment, housing, education, leisure, marriage, family, church, and the exercise of political rights." The chair of the Committee of Fifteen, Edward Dowey, later explained that the specific inclusion of marriage in the list was a direct response to the 1965 Columbus assembly. With Richard and Mildred Loving pursuing their case against the Commonwealth of Virginia , commissioners to the Columbus assembly had, in Dowey's words, "passionate debates, public and private, long into the night," about interracial marriage. By the Portland assembly, opposition to the anti-discrimination passage was nil -- as Presbyterians gathered, Earl Warren's Supreme Court was about to abolish Virginia's anti-miscegenation statute, and Presbyterians rapidly adapted to a changed political reality. In the second path of reconciliation, Presbyterians are "called to practice the forgiveness of enemies and to commend to the nations as practical politics the search for cooperation and peace [...] even at risk to national security, to reduce areas of strife and to broaden international understanding." While knee-jerk anticommunism of the kind practiced by Dorothy Orr of Council Bluffs, Iowa, as quoted above was less prevalent in the denomination in 1967 than it had been a decade earlier, the phrase "at risk to national security" caused great consternation among national-security Presbyterians, such as elder Robert McNamara. No sooner had C67 passed the floor of the Assembly, by roughly an 80-20 margin, than the Presbytery of Washington, D.C. offered an amendment striking "even at risk to national security." The Committee on Bills and Overtures was sharply divided, finally voting down the proposal 12-11. The floor sustained the committee's action, and a statement of radical pacifism entered Presbyterian doctrine. Q: Have you ever been a member of any organization, association, or conspiracy, dedicated to the overthrow of Lyndon Baines Johnson? A: I once went to Harvard. A: I belong to the Presbyterian Church. 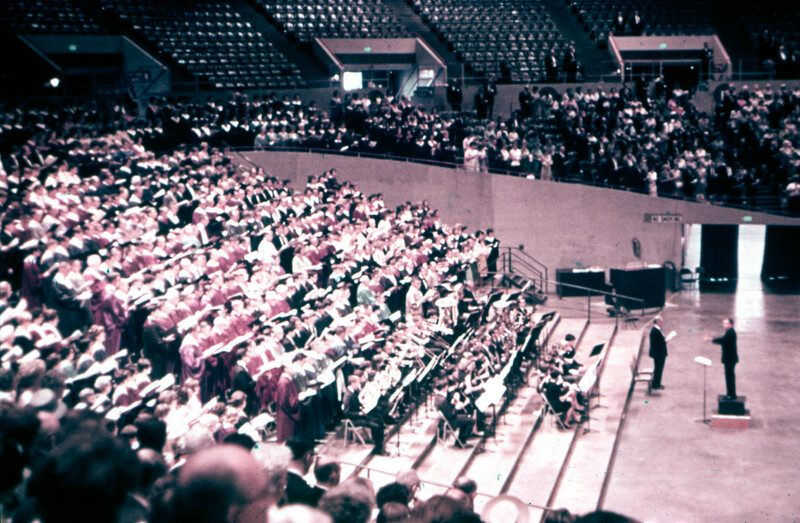 The 1965-1966 period of revision and study brought to life two conservative Presbyterian organizations, and created a platform for one old one. 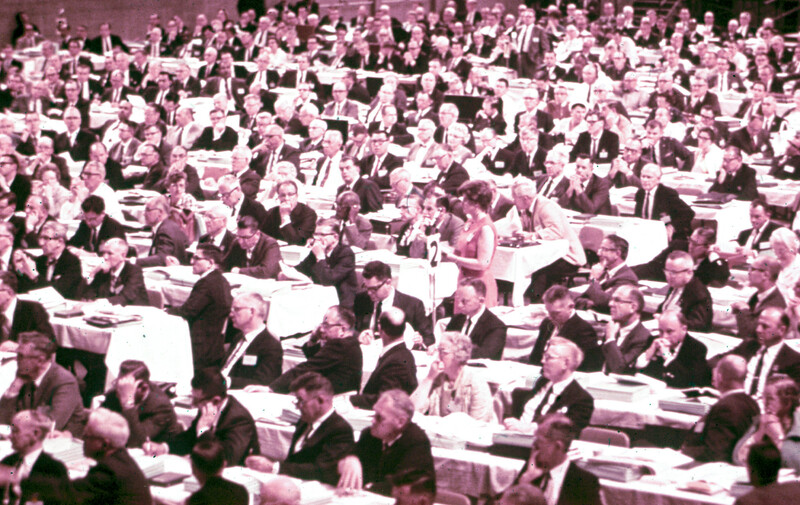 Presbyterians United for Biblical Concerns, organized in 1965, pressed the Committee of Fifteen on issues of Biblical inerrancy and conventional morality. Working through regular channels, PUBC succeeded in inserting into the fourth passage on reconciliation language in tune with, as PUBC wrote, "the moral law as expounded by Jesus Christ to matters of social concern such as the 'new morality,' divorce, drunkenness, and delinquency." In direct response, the Committee added to section 9.47 "Anarchy in sexual relationships is a symptom of man's alienation from God, his neighbor, and himself." Such mollification of conservatives led Board of National Missions General Secretary Kenneth Neigh to say of the final document, "I wouldn't say it's liberal at all." PUBC accepted the edits and supported passage of the Confession in Portland. In May of 1966, oilman J. Howard Pew wrote a scathing column in Reader's Digest, lambasting the Committee of Fifteen for abandoning the inerrancy of scripture, and castigating Presbyterian leadership for failing to obey the rule of law. Pew, of course, was indirectly referring to the outspoken Eugene Carson Blake, who in 1963 had been arrested in suburban Baltimore  in an attempt to desegregate an amusement park. "If the church's 'social activists,'" wrote Pew, "are to be halted from plunging the church again into areas where it has no jurisdiction, its concerned laymen and clergymen will have to make their voices heard more clearly in the high councils of the denominations." Pew would chair the National Lay Committee, sponsor the Presbyterian Layman magazine, publish Christianity Today, and set aside $100 million dollars  -- the Pew Freedom Trust -- to, among other things, "acquaint the American people with the values of a free market—the dangers of inflation—the need for a stable monetary standard." Finally, the passage of C67 offered a platform to the denomination's indefatigable gadfly -- and UFO believer  -- Carl McIntire, who parked a hearse outside the Assembly, and delivered a live radio broadcast  decrying the denomination's appeasement of "Red China," virtually libelling Dean Rusk and Robert McNamara as communists, and claiming to have the names of the communists who ran Portland's "United Presbyterian coffee house." McIntire, citing the FCC's fairness doctrine, declined to name them: "My radio station would probably be in great trouble if I read all these names, accusing them of being communist-infiltrated and the like. So I can't read them to you." 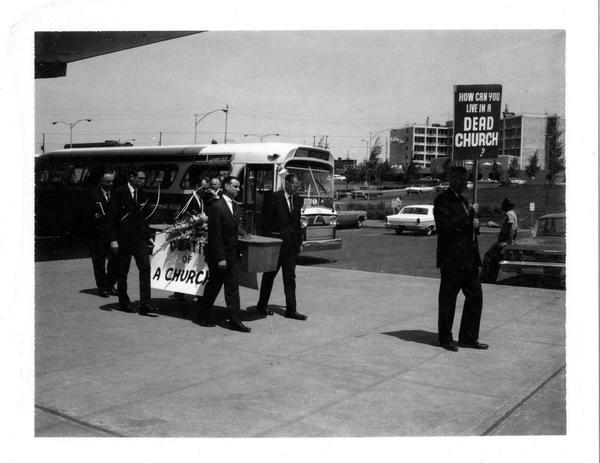 His hearse carried a banner, all-caps: "Death of a Church." An abridged version of this post can be found in Presbyterian Heritage, Spring/Summer 2016 .